A stylish villa of minimalist-architecture, with great sea views over Big Buddha bay. Amenities WiFi internet, satellite TV with 42" plasma screen, stereo, air-con throughout, fully equipped kitchen, indoor and outdoor Jacuzzis. Villa Doozie is designed in architecturally minimalist style, with glass walls facing the breathtaking views across Big Buddha bay of emerald seas, distant islands, and spectacular sunsets. Combining comfortable interiors with seamless indoor-outdoor tropical living, the villa offers a great venue for entertainment and relaxation in one of Koh Samui’s most convenient and sought after locations. Entered up a flight of stairs from the car port, the large, open-plan living room on the first floor has sliding glass walls on the front and back, which allow the sea breeze to flow through the house, and frame the ever-changing seascape beyond. The lounge area features capacious sofa set, with a coffee table and 42” plasma screen home theatre system. The dining area seats 6 facing the views. A fully equipped, fitted kitchen is separated by a breakfast bar with stools. The front face of the living room opens onto the spacious sand-wash pool deck. An al-fresco dining set, sun-loungers, and an outdoor shower, complete the deck area. The aquamarine-tiled infinity-edge swimming pool blends into the sea beyond, with a large Jacuzzi extension in the far corner. An open staircase leads up from the living room to the second floor, with the adjacent glass wall extending across the two floors. A gallery landing interconnects the three bedrooms, and an external stairway leads to a rooftop viewing deck. All of the bedrooms on the second floor are air-conditioned, with sliding glass walls that open onto a balcony and integrate the sea views. The master bedroom features a TV, king-size leather bed, built-in wardrobe with a safe, a large en-suite bathroom with a Jacuzzi tub, and separate rain shower. The additional two bedrooms; a double and a twin, share a bathroom with rain shower. Two double bedrooms are located on the floor below the living room and pool deck. The bedrooms are seperated by curtains, share a bathroom with a shower, and feature a comfortable sofa facing a TV, and sea views. This lower floor unit is accessed from the car port or a stairway from the pool deck. Villa Doozie is fully air-conditioned throughout, and includes complimentary WiFi internet connection. The nearby fresh produce and fish market offers a window onto the laid-back local life and flavours. The villa is located within walking distance of Big Buddha beach and temple, with a variety of restaurants and shops, although the climb up the steep hill leading to the villa is rather strenuous, particularly in the tropical heat. 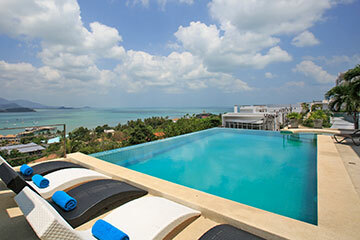 Five minutes drive from Koh Samui airport, Bang Rak, and Choeng Mon beach, the villa is less than 10 minutes drive from Chaweng and Bophut Fisherman’s village, and around 20 minutes from Santiburi Golf and Country club. Rates are for exclusive use of the entire property, with 4 bedrooms sleeping 10. -Rates are specified in THB, inclusive of maid service, twice a week. -Airport transfers are charged at 500 THB per trip. -Electricity is charged at 6 THB per KWH. -Check-in time is 16:00, and check-out time is 11:00. *A security deposit of 20000 THB, or any equivalent currency, is required on arrival, to be refunded on departure, less any damages or outstanding bills. Pay 6 nights stay 7 nights, cumulative for stays during low season dates. Applicable to 4 bedroom occupancy rates only, and cannot be used in conjunction with other promotions.